Finally Prince William decided to make an honest woman out of Kate Middleton whom we now speak of as "Catherine" which begs the question why hasn't she been "Cate" all these years? Since there is renewed interest in those pesky Windsors, our Famous Food Friday is William's mom, Princess Diana. It seems her personal chef, Darren McGrady, penned a cookbook featuring Diana's favorite dishes entitled Eating Royally. McGrady began working at Buckingham Palace where he tells us that working for the Queen is a live-in job. You get housing, health care, clothing, six weeks of vacation, long-term employment and really crappy pay. When he first went to Balmoral (brilliantly portrayed in the movie The Queen, he was preforming poorly at the vegetable station. The Head Chef came over. "Right, Now let me show you how to prepare the Queen's carrots." He then took three very large carrots, peeled, trimmed and topped them. He then sliced them length wise and in half so that each carrot was of equal length. The carrots were then placed in a white paper bag and the bag was folded shut. "There," he said, "That's how to do it." "But Chef," I asked, now totally bewildered, "aren't they a bit large and don't we need to cook them?" "Large?" His eyebrows shot up. "Of course not. They will be fine for the horses. And don't ever cut them any shorter than that of she will blame up when the damn horses bite her fingers." The cookbook reflects the Windsor's dinning habits which means you are looking at recipes that reflect the style of the 1950's. 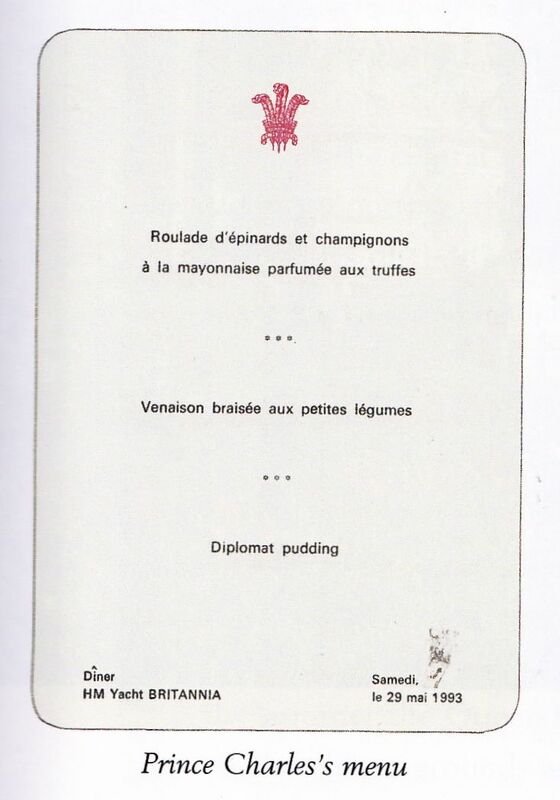 There is a lot of mayonnaise, cold fish terrines and desserts. Meat, potatoes and peas. There is not a sous-vide machine in site. 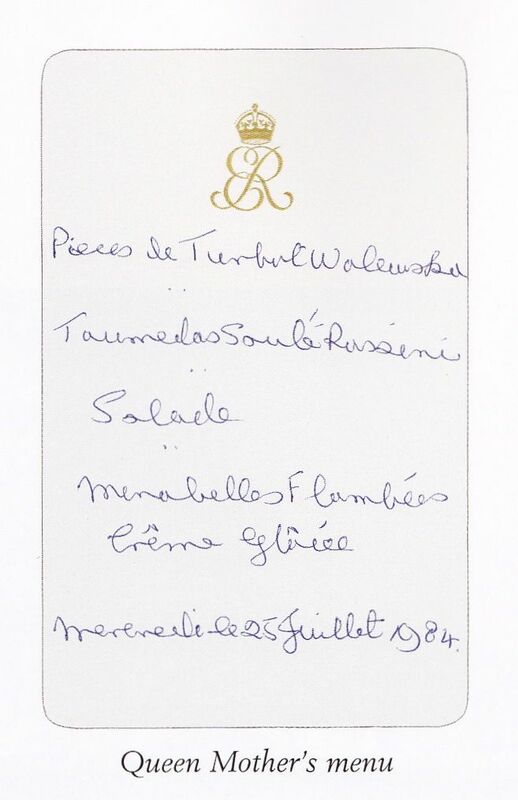 Here is a fine example of cooking for Royalty. It is a rather "simple" recipe for lemonade, a popular drink served after boarding the Britannia. Place the sugar, Epsom salts, citric acid, tartaric acid, lemon juice, and zest in a bowl and whisk them together. Bring 5 cups of water to a boil and pour over the lemon mix, whisking until combined. Refrigerate until cold and decant into screw-top bottles. To serve, dilute 1/4 cup of the lemon refresher with 2 cups of water over ice or to taste. McGrady assures us that Princess Diana was a bit more relaxed than the rest of the clan. Unfortunately, the food was pretty much the same. As he waited for Diana to return home from vacation, he saw on television, like most of the world, that his boss, the Princess would not be retuning. Mohammed Al Fayed promised jobs to any member of the Princess' staff who wanted one. 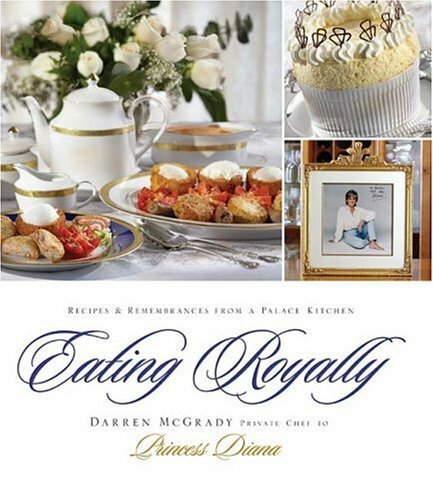 Prince Charles asked McGrady to be his personal chef, but he felt Diana would have felt betrayed, so he left the royal kitchen. This may not be the best cookbook to actually cook from, but the stories of the kitchens is rather fascinating. 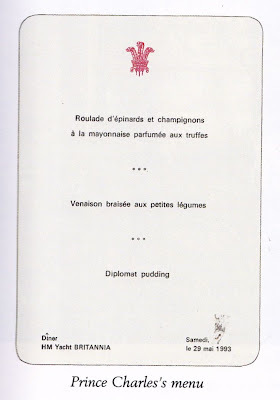 Am I the only one who thinks it is odd that the menus for the British Royal Family are in French? I hope 2011 brings you much joy and happiness! 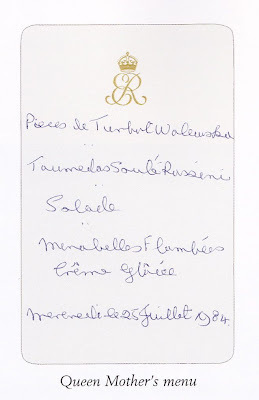 I didn't know that princess Diana has a cookbook, awesome fact indeed.